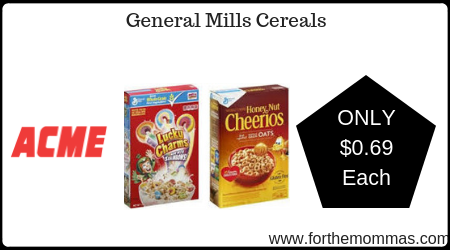 Acme: General Mills Cereals ONLY $0.69 Each Starting 1/18! Starting 1/18, Acme has a great deal on Honey Nut Cheerios Cereals and Lucky Charms Cereals. They are priced at $1.69 each, plus we have Honey Nut Cheerios Cereals and Lucky Charms Cereals coupon to use on this deal that will make the final price just $0.69 each! Note: You can mix or match cereals.